Jamie August is a reporter for the Ocean City Weekly Breeze, a lifestyle, breezy newspaper, but she wants to be an investigative reporter reporting on news and not on the color schemes for the new housing development. However, it is a job, and she needs that. So she writes articles on the latest trends in dog grooming and sets out to write about Bayview Preserve, the soon-to-open flagship community for Ivory Enterprises. However, she quickly learns that there is a lot more to uncover than just decorating trends. She discovers bribery, murder, kickbacks, and blackmail. If she’s not very careful, her murder will soon be added to the list of crimes for which Ivory Enterprises has never been held accountable. I liked Jamie. She is definitely a quirky character with some questionable traits, such as getting drunk and then sleeping with someone she met at a bar. When that someone turns out to be the married son of the owner of Ivory Enterprises, her life becomes truly interesting and very dangerous. The pacing Ocean City Lowdown, is excellent. It drew me in from the first page, and as the story progressed, the intensity grows, until it soon became impossible to put the book down. Clues abound and the plot has a lot of twists and turns. The characters are very well drawn and interesting. There is the car dealer who decides to place his mother’s beloved Impala on the roof of his car dealership. There is Tammy, the librarian who does research for Jamie in return for meatball subs. Jamie travels by bus and the bus drivers are also very distinct and real. And the further Jamie gets into her research, the more characters she meets, some of whom she could definitely do without. 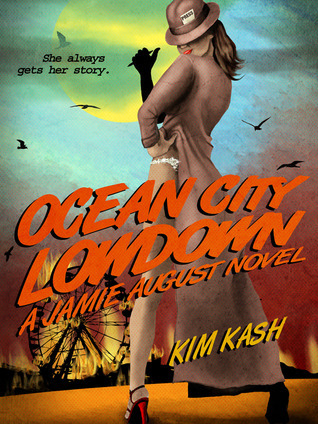 Mystery lovers who enjoy an action-packed story with great characters set in an interesting location are sure to find Ocean City Lowdown an exciting read.